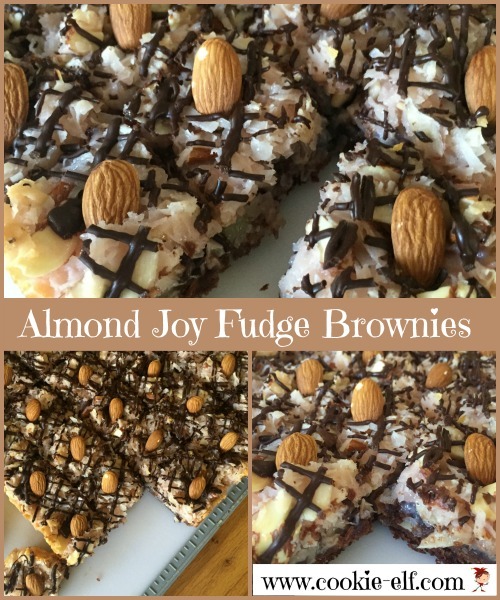 This Almond Joy Fudge Brownies recipe mimics Almond Joy candy bars. If you like chocolate, coconut and almonds, you will be in heaven. D-E-L-I-S-H! Almond Joy bars were developed by Peter Paul Candy Manufacturing Company in 1946 (now owned by Hershey) as a sibling to the Mounds bar, which was wildly popular with the U.S. military during World War II. If you know candy bars, you probably know the differences between the two. While Mounds is shredded coconut and dark chocolate, Almond Joy is made with milk chocolate-covered coconut topped with (of course) whole almonds. But back to this recipe. It’s got the Almond Joy’s chocolate, coconut, and almonds all combined in an amazing bar cookie. Plus it’s so easy to make, especially if you use a brownie mix for the bottom layer. The other layers are just measure, mix, spread (or drizzle), and bake. Preheat oven to 350º F. Coat the bottom of a 13 x 9 pan with vegetable spray. Or line the pan with aluminum foil, allowing ends to extend over two sides of the pan, and then coat the liner lightly with vegetable spray. Brownie Layer: In a medium bowl use an electric mixer or a wooden spoon to combine brownie mix, oil, eggs, and water according to package directions for cake-like brownies. Bake brownies 25-30 minutes until a toothpick inserted 2 inches from outside of the pan comes out clean. Do not over bake. Filling: while brownie layer is in the oven, combine filling ingredients. Place coconut, sliced or slivered almonds, almond extract, and sweetened condensed milk in a mixing bowl. Use a large spoon to combine ingredients until all coconut flakes and almonds are coated. If desired, add 2-3 drops of food coloring to tint the filling layer. Mix thoroughly. Remove brownies from the oven. Use a large spoon to drop dollops of the filling mixture over brownie surface. Spread the filling evenly using a spatula or with your moistened fingertips. Bake brownies 15 minutes longer. Remove brownies from the oven just as the edges begin to turn golden brown. Drizzle: To make the chocolate drizzle, break up baking chocolate into squares. Place it in a quart-sized freezer bag. Add shortening. Microwave 20 seconds on High. Massage sides of freezer bag to mix and loosen chocolate. Repeat until chocolate mixture is melted and smooth. Clip off corner of freezer bag to pipe drizzle onto cooled brownies. Grasp ends of pan liner and lift the bars from the pan. Peel away the foil or parchment paper. Use a sharp knife to cut the brownies into 6 rows of 6, 6 rows of 8, or in any other size you wish. Press a whole almond into the center of each brownie. Store bars with waxed paper between layers, either at room temperature or in the refrigerator. Follow recipe directions on the brownie mix for cake-like brownies, rather than fudge-like brownies, so the bars have a firmer bottom layer. You may wish to toast almonds for the filling for added flavor.